I love blog tours! 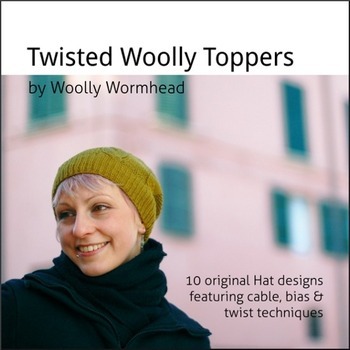 This month I'm participating in the tour for Woolly Wormhead's new book, Twisted Woolly Toppers. It's a lovely book (available electronically or in print) with 10 different hat patterns for children thru adult men, each of which have cables or twisted stitches on them. My favorite hat in the book is Medici, but since that was already discussed in the previous posting on the tour (by Stolen Stitches), I decided to talk to Woolly about two of the cutest hats - Floralys and Tinker. 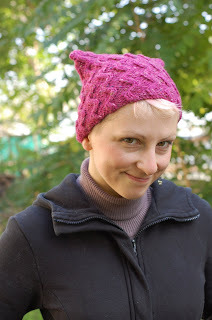 First, it's interesting to me how many different shapes you do have in the book - beanie and slouch are traditional, but the shape in Tinker and Floralys is really simple to achieve and yet not found very often in hats. Why do you think that's the case? This simple shape occurs mostly in children's Hats, rarely in adult Hats, and I think that's why it isn't as common as a beanie or beret. But why should the little people have all of the fun? I love to mix things up and give big people the chance to wear fun Hats too. It is a great shape to work with and so easy to knit due to it's straightforward shape. For these two hats, what came first, the stitch or the shape? With Tinker, I imagined the whole Hat – stitch pattern and shape together. The idea came to me as I went to bed one evening, and worked on it the very next day. Floralys came to me in shape first, with the idea of those cabled panels, so I experimented to get the cables just right. One of the things I like about this book is how you took the idea of cables on hats - which is pretty traditional too - and then altered the idea to make something different. An example is the cable on Floralys. The cables don't line up exactly - the bobble from the left of the front cable meets the bobble of the left side of the back. Is that what you saw in your head when you were designing, or was that a happy accident when it came time to finish off the top? The cable panels on this Hat were designed to be at the edges, so how they meet in the middle will vary with each size. Adjusting the pattern so they meet in the middle is easily done, should that be the effect the knitter desires! The structure of Floralys, and how the 'ears' stand up is down to the cabled panels sitting at the side, giving it a slight asymmetrical feel. Repositioning the cable panels may affect this, but not much, as nearly all of the sizes, with the width of the panels, are close to meeting in the middle. At first when I saw these hats I thought they had been knit flat and then seamed up the sides, rather than as a tube closed at the top. Do you think converting to a flat version would be useful to a knitter afraid of circs? When would you choose to knit a flat hat over a round one? Converting either of these 2 Hats to be knit flat and seamed would be very simple, and ideal for anyone unsure of knitting in the round. Generally though, if a Hat is knitted vertically (i.e bottom up or top down) I would recommend knitting in the round to avoid seaming. Most of the hats in this book are sized for baby through adult male. Do you think there are shapes that are more suited to children vs. adults or men vs. women? Where do you think most people are comfortable with busting out of a hat "comfort zone?" I think that beanies are generally preferred for the men, berets or slouchies for the women, and anything a little different for children. That's certainly been my experience anyway. For me though, I feel it's important to offer a range of sizes so that people can knit a style that they wouldn't normally wear (as well as provide for those with other than average sizing) – it may be the texture or colour that encourages someone to break out of their comfort zone and I'm all for encouraging knitters to try something different! How did you come up with the names Floralys and Tinker? I have a notebook that I carry around with me, for jotting design ideas, pattern notes etc. There's a page or two of inspirational names, as I find that I'm terrible at naming patterns! Floralys was one of those names – I can't remember where the initial idea came from but I thought it suited the Hat nicely. Tinker had a working name, Zig-Zag Topper; it could have stayed as it was, but I wanted something more imaginative! It took us (myself and my partner) quite some time to find a name that demonstrated it's impish charm. What's next on your needles? Lace hats? Colorwork? I've a few Hats on the needles right now, some cabled, some lace, some textured. There's always a few in progress. The current ones are mostly secret knitting, or commissioned designs from yarn companies. Lots of new patterns will start appearing later in the year! Thanks, Woolly! The next stop on the tour is next week, at Faina's Knitting Mode. Check it out! I loved learning about these two patterns! I'm also glad to hear that even the genius Woolly Wormhead struggles with names. Thanks for the delightful interview. Awesome :) this looks like one I'll try to get my hands on. I'd also like to know who organized the blog tour? It was Woolly herself who put together the tour. We had lots of fun on it!